A welcome addition to an understocked genre, Zoo Cube is a great little puzzle game with a lot of depth behind the title. 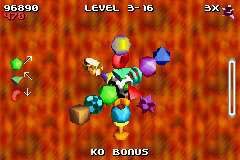 Before any of you get any ideas with the chimp on the cover, there aren't really any animals in the game, having been replaced by blocks. If you want animals, go buy the GameCube version. The premise behind the game is easy enough. You must control a cube spinning in freespace. 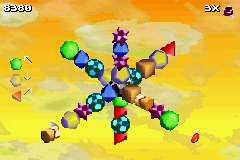 The cube can be rotated in all directions on a single axis. Blocks representing animals approach the cube and are caught on each end of it. Match blocks and you free the animal caught inside of them. It is frustrating at first getting used to the way that the cube rotates and then on top of that trying to place the blocks strategically to get the best score out of them. That's correct, you do need to be aware of your block placement as they create powerups when correctly matched that will enhance your score. And to take advantage of all 7 levels available you will need a high score to progress. There are a number of ways to score bonuses within the game. One of those being a balance bonus whereby you put the same amount of blocks on each line on every side. The thicker you make the balance the more points you will win. Of course though if you exceed six blocks on one side the game is over and it's back to square one. When clearing a line, a juggling ball appears. If you can keep the ball "alive" on the cube your score will increase along the way. Graphically the game looks very nice and plays well. It does get a bit hectic as you get further along but that's the whole idea to keep you on your toes. Just like Tetris did. The backgrounds are unobtrusive and do not affect gameplay. 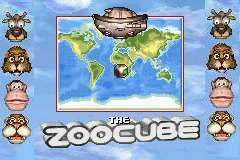 Zoo Cube also supports multiplayer through link cable for cooperative and competitive games. There are save points on the cartridge for high scores only which is a shame as the level of information provided in Tetris would have been nice such as how many lines cleared. 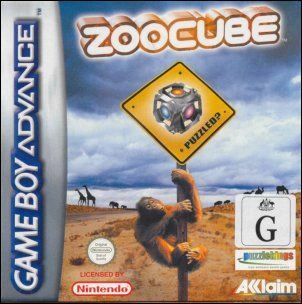 Zoo Cube on GBA is a strong puzzle title that will keep the whole family busy and is perfect for long car trips. This is a good solid game and a nice addition to your cartridge library.